Area 3 or the Middle Atlantic Area is one of seven regional components of the Assembly of the American Psychiatric Association. Each area has a Council that is comprised of an area representative, an area deputy representative and representatives from various entities. Area 3 encompasses the District Branches of Delaware, Maryland, New Jersey, and Pennsylvania, and the Washington Psychiatric Society, a district branch that consists of three chapters - Wash, DC, Northern Virginia, and the Maryland suburbs of the District of Columbia. In addition to District Branch representatives, two subspecialty organizations (American Association of Psychiatric Administrators and The American Society for Adolescent Psychiatry) and the Southern Psychiatric Association have representatives on the Area 3 Council. There are representatives for Early Career Psychiatrists (ECP), Minority/Underrepresented (M/UR) - Women Psychiatrists Caucus and Resident-Fellow Members ﻿(RFM). Click Here for Mental Health Parity Poster. 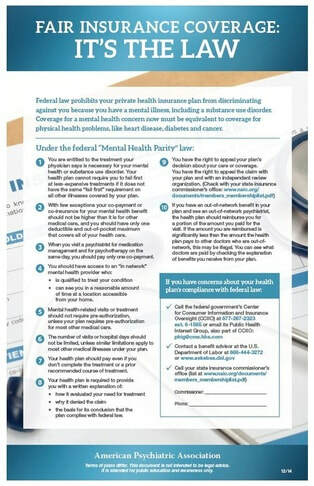 Click Here for Mental Health Parity Final Rule. Click Here for APA Mental Health Parity Final Rule Highlights. No to Psychologist Prescribing Privileges! Area 3 Congratulates Ken Certa, MD for being elected our Area 3 Trustee. We thank Barry Herman, MD and Roger Peele, MD for their candidacies.